Diarmuid Johnson and Bríd Harper. 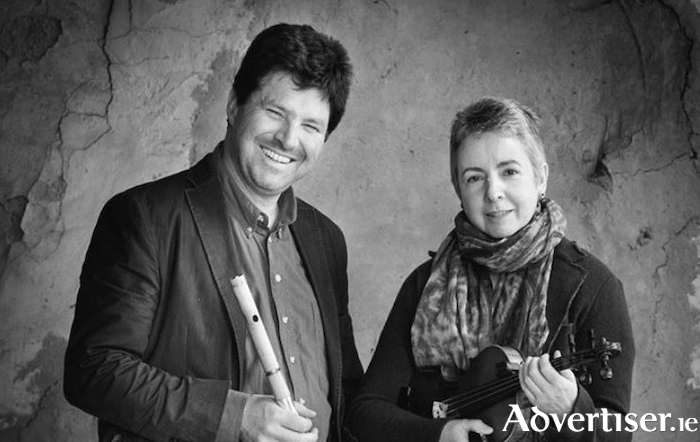 AN EVENING of storytelling and trad music will take place in Charlie Byrne’s Bookshop when Diarmuid Johnson reads excerpts from his new book, Tuatha De Danann, accompanied by Donegal fiddle player Bríd Harper. Tuatha Dé Danann is a lively retelling of the Irish epic Cath Maighe Tuiredh (Battle of Moytura ), an account of the invasion and conquest of Ireland by the Tuatha Dé Danann. The reading takes place on Friday October 5 at 6.30pm. Diarmuid Johnson was born in Cardiff in 1965 and brought up in Ireland, receiving his education through the medium of Irish. Since 1989, he has worked as a university lecturer and visiting professor in Ireland, Wales, Brittany, Germany, and Poland. The author and co-author of many books, he is also an accomplished musician, and his flute-playing features on various recordings. Since 2016, he has been broadcasting with Raidió na Gaeltachta as foreign correspondent, and teaching Irish on summer courses in Donegal and Connemara. The reading is organised in conjunction with LoveLeabharGaeilge. Admission is free and all are welcome.